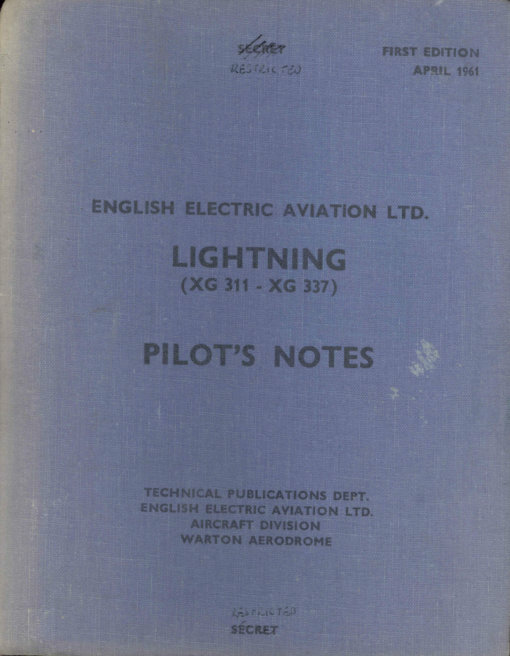 The Lightning was the first British aircraft capable of twice the speed of sound, and was a favourite performer at air shows due to its spectacular performance. 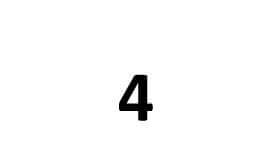 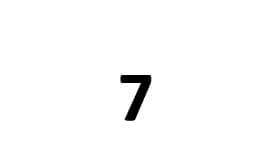 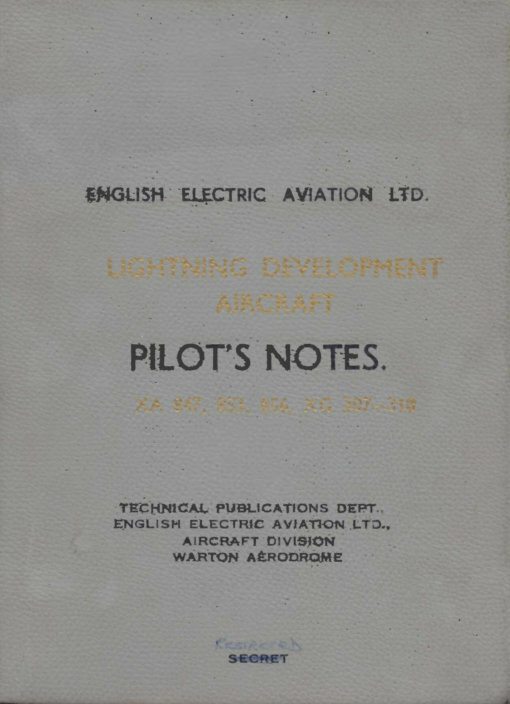 Due to the radically new nature of the design, extensive development was undertaken. Two prototypes, known as the P1A, were initially built, using basic engines without afterburning. 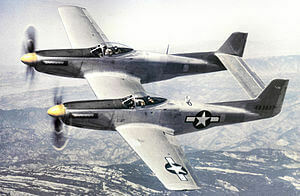 These first flew in 1954 and eventually were able to exceed mach 1. Twenty more development aircraft, known as the P1B, were built and these first flew in 1957. 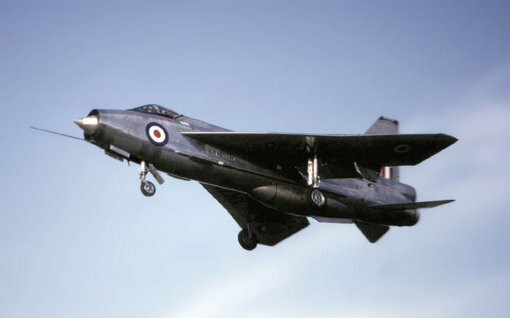 The first production aircraft flew in 1959 and entered service in 1960. 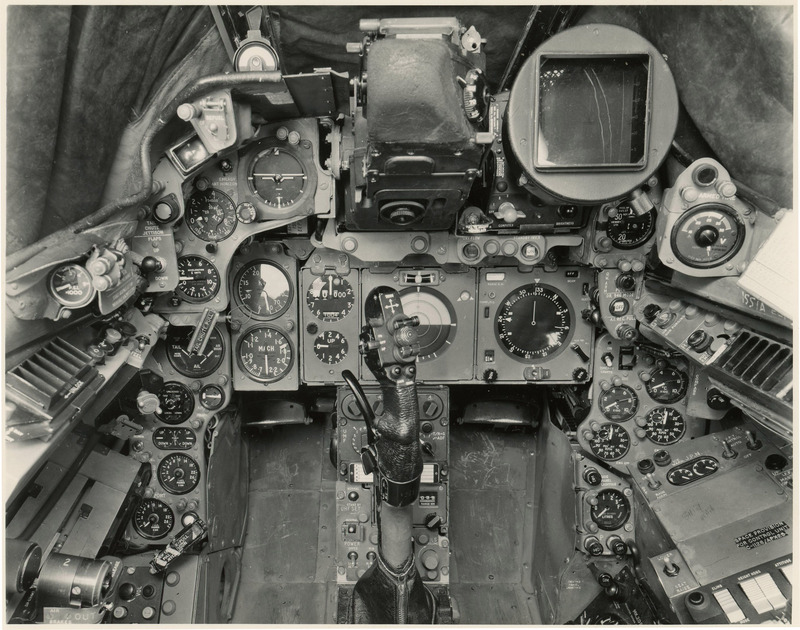 The aircraft was subject to continuous development up to the final version, the F.6. 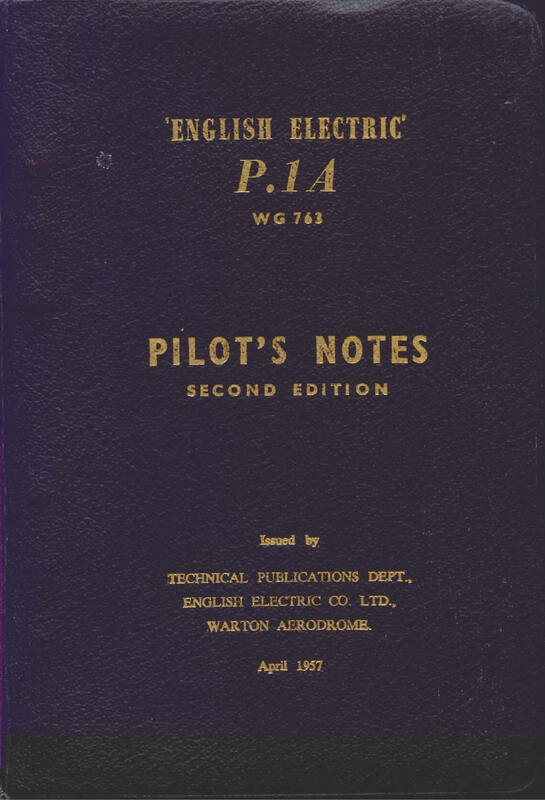 Even this version however had a very limited endurance due to the small fuel tank capacity. 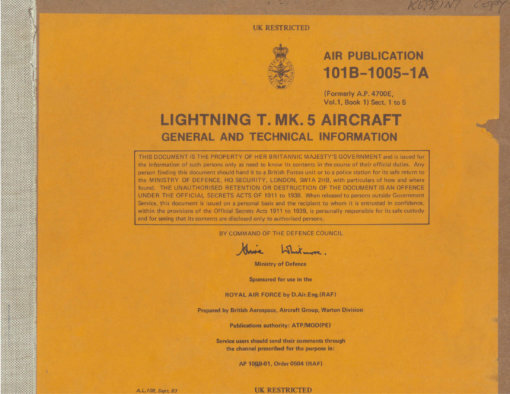 The aircraft always had maintenance and reliability problems, believed to be the reason the UK CAA refused to allow civil operation of the aircraft as warbirds. The aircrafts performance, especially climb-rate, was impressive, even by todays standards. 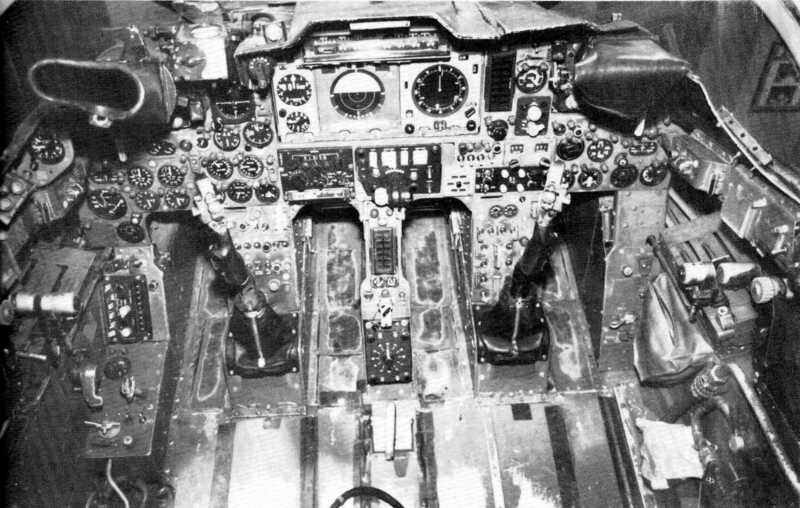 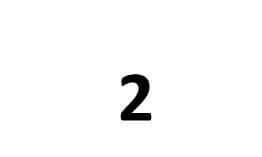 It has also been recently revealed that the aircraft had a very high service ceiling, capable of intercepting U-2 aircraft. 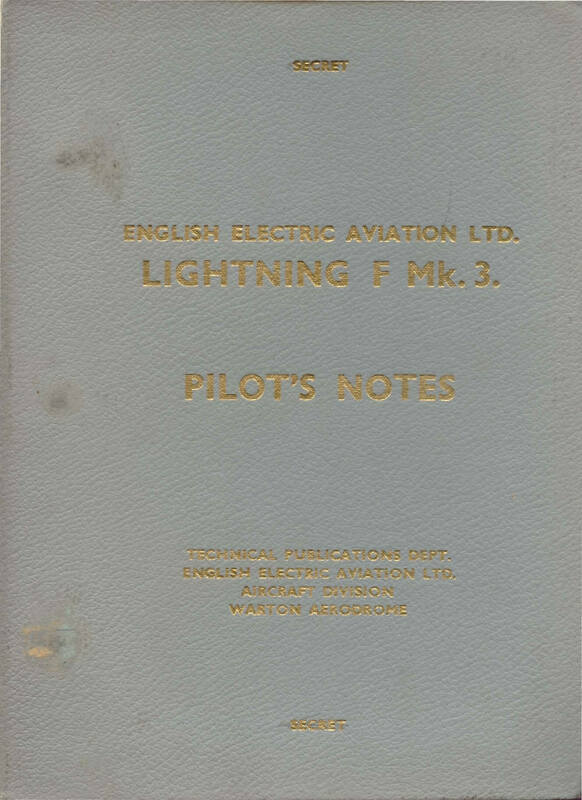 We offer nine titles for various marks of the English Electric Lightning, including the main RAF variants plus the export models sold to the Middle East. 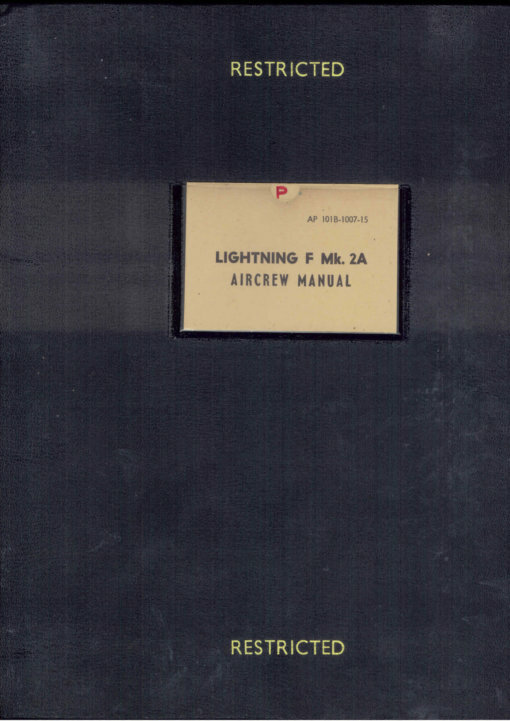 Each file has been scanned from the original flight or maintenance manuals and retains any colour pages. Each title is US$9.95. 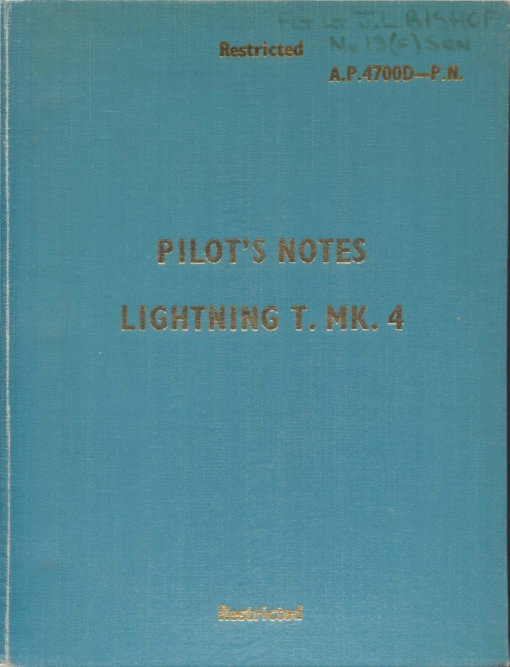 RAF Pilot’s Notes for the Lightning F.1 and F.1A, AP 4700A and F-PN dated February 1962, with approx 220 pages. 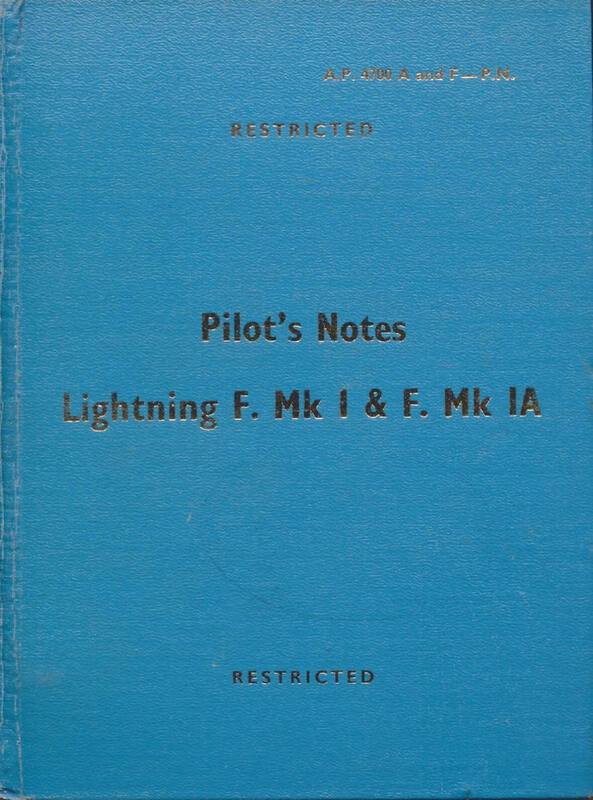 RAF Pilot’s Notes for the Lightning T.4, AP 101B-1004-15 dated January 1963, with approx 215 pages. 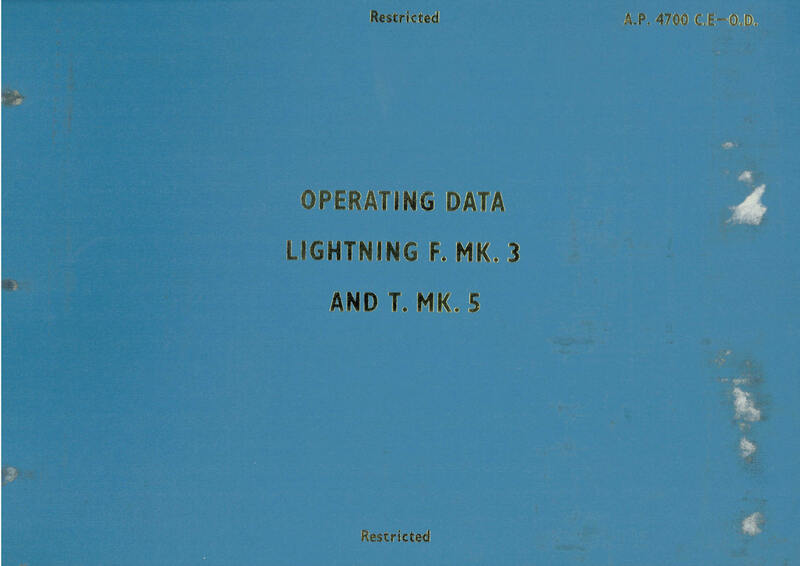 RAF Operating Data Manual for the Lightning F.1, F.2 and T.4, AP 101B-1001,2,4-16 dated January 1961, with approx 165 pages. RAF Pilot’s Notes for the Lightning F.2, AP 101B-1002-15 dated November 1963, with approx 239 pages. 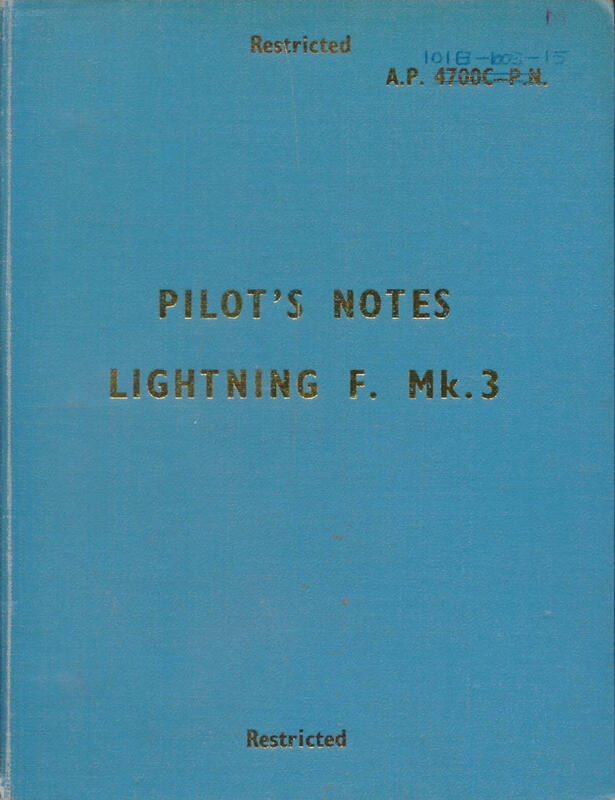 RAF Pilot’s Notes for the Lightning F.3, AP 101B-1003-15 dated April 1965, with approx 247 pages. 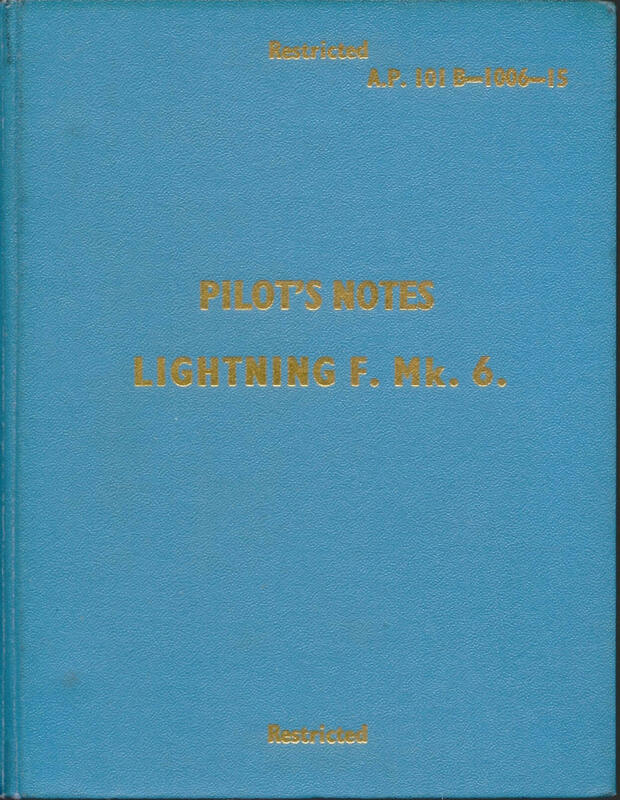 RAF Pilot’s Notes for the Lightning T.5, AP 101B-1005-15 dated November 1965, with approx 249 pages. 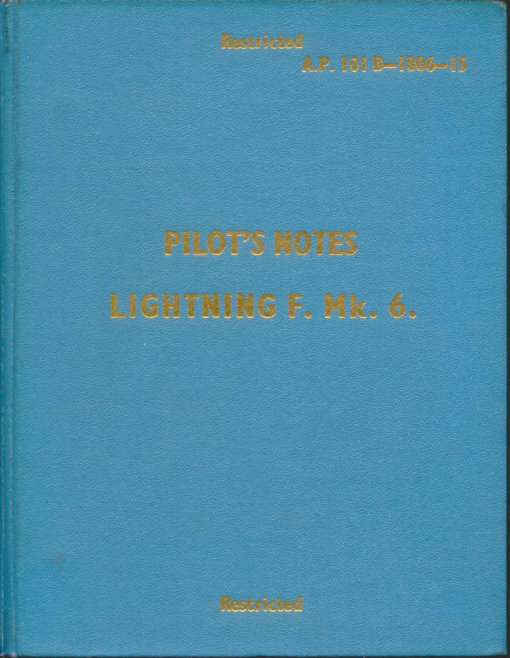 RAF Pilot’s Notes for the Lightning F.6, AP 101B-1006-15 dated September 1966, with approx 269 pages. 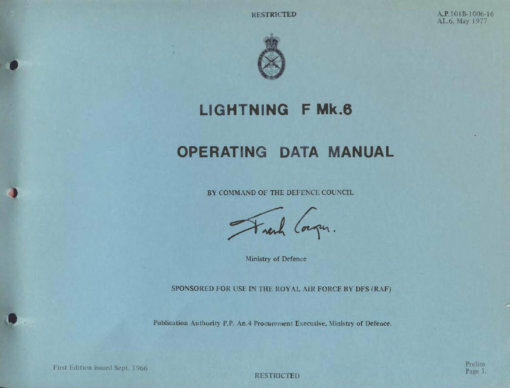 RAF Operating Data Manual for the Lightning F.6, AP 101B-1006-16 at AL7 dated May 1977, with approx 329 pages. 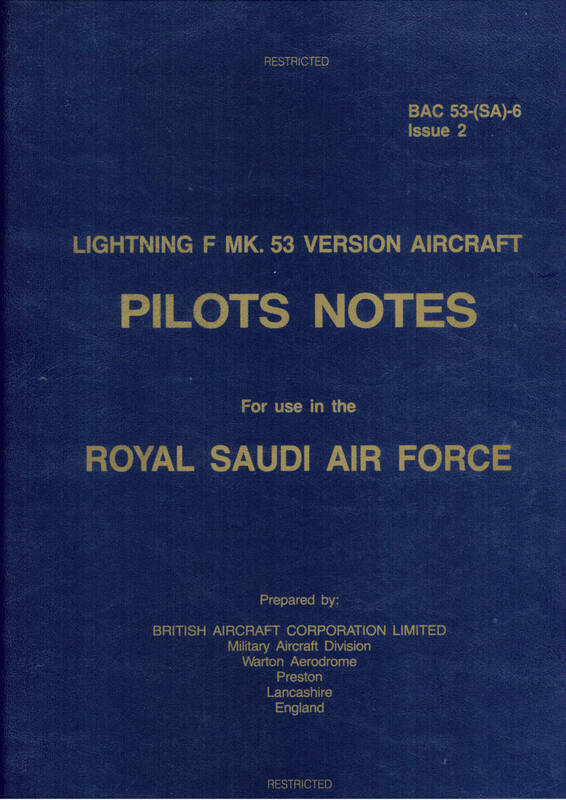 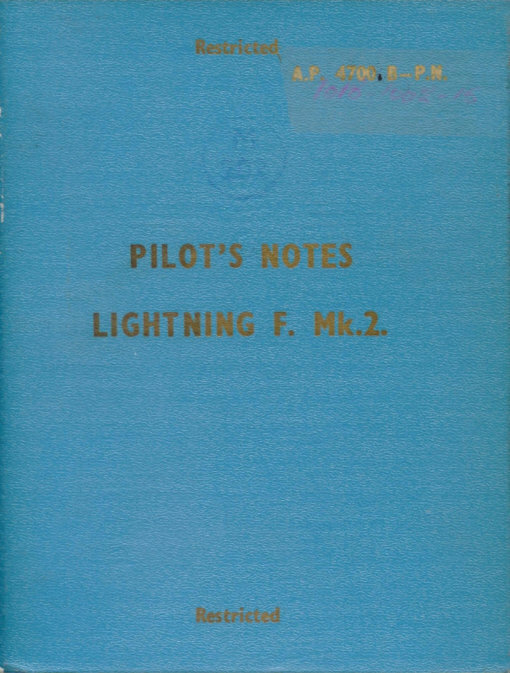 Manufacturer’s Pilot’s Notes for the Lightning F.53 (RSAF), BAC 53-(SA)-6 at Issue 2 dated December 1983 with approx 324 pages. 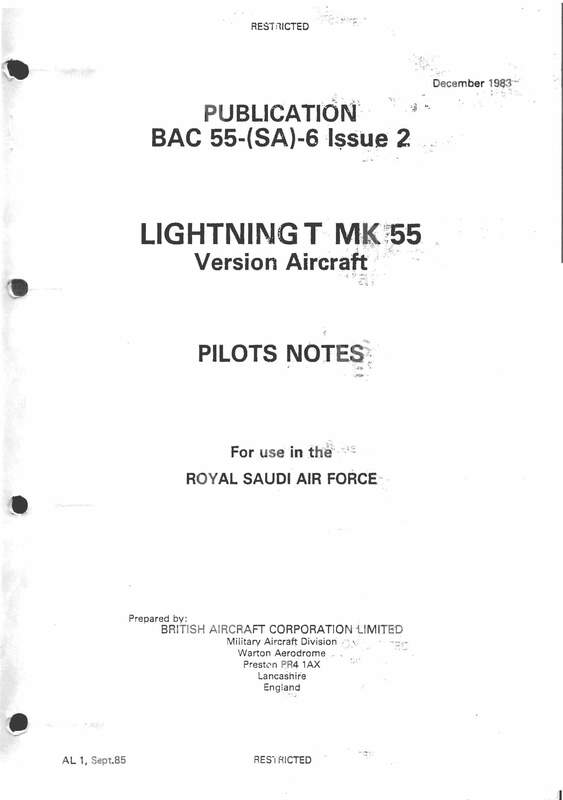 Manufacturer’s Pilot’s Notes for the Lightning T.55 (RSAF), BAC 55-(SA)-6 at Issue 2 dated December 1983 with approx 314 pages. 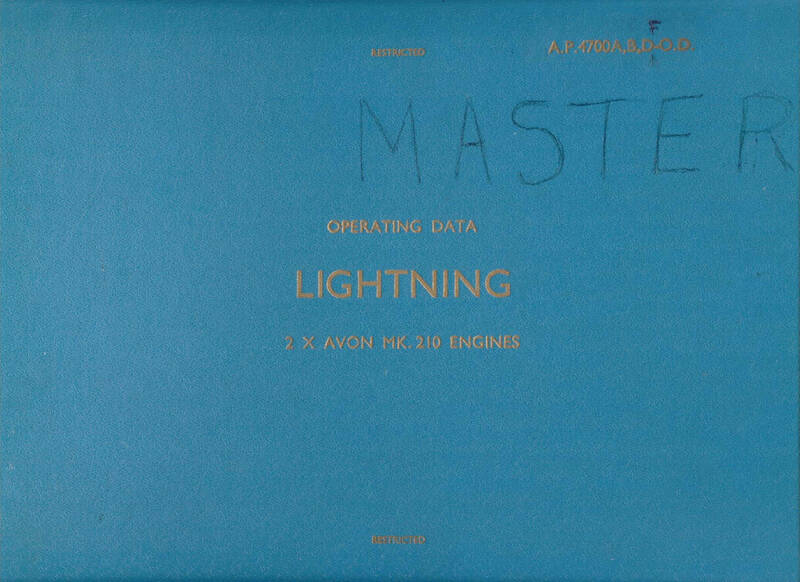 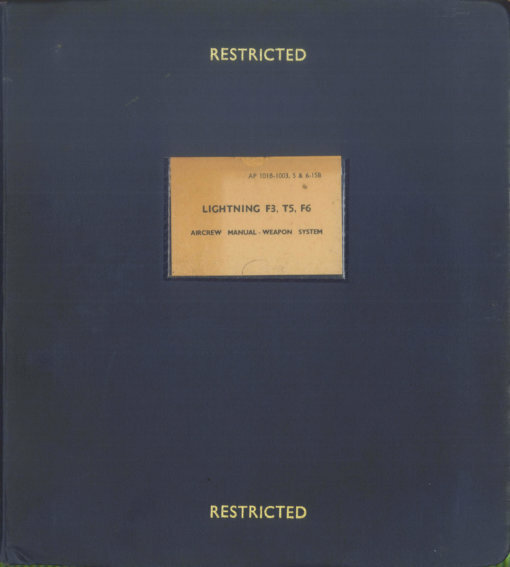 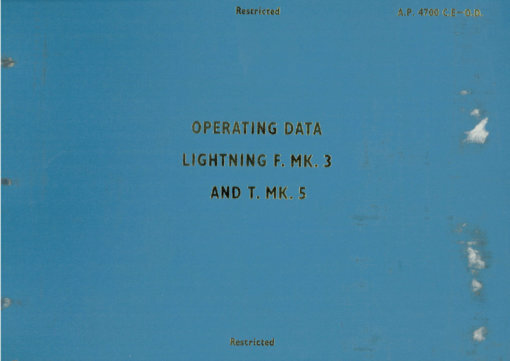 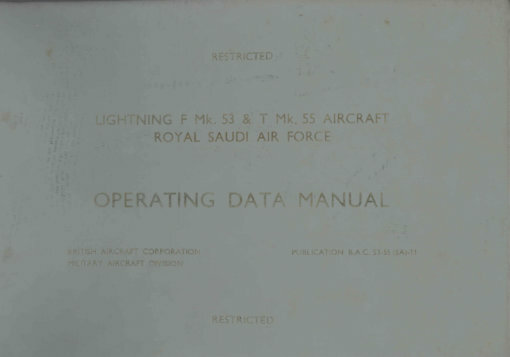 Manufacturer’s Operating Data Manual for the Lightning F.53 and T.55, undated with approx 401 pages. 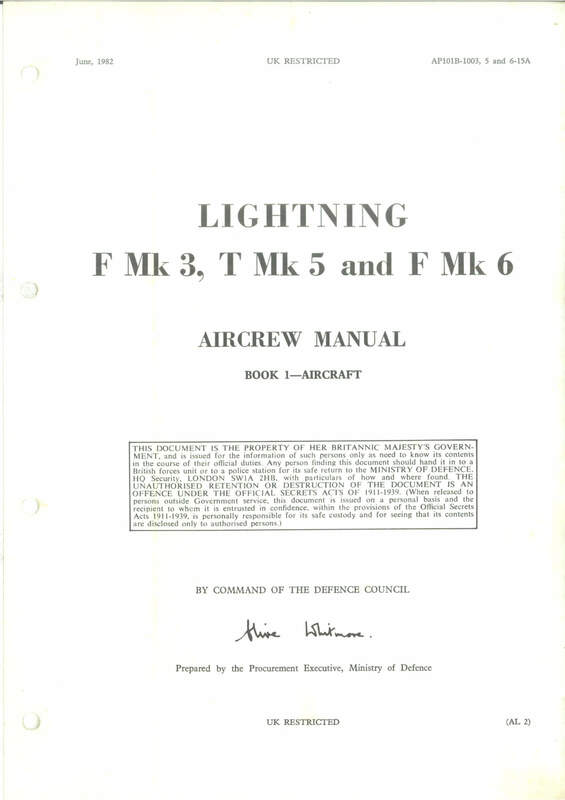 RAF Aircrew Manual for the Lightning F.3, T.5 and F.6, Book 1 – Aircraft, AP 101B-1003,5,6-15A, dated June 1982 with approx 186 pages. 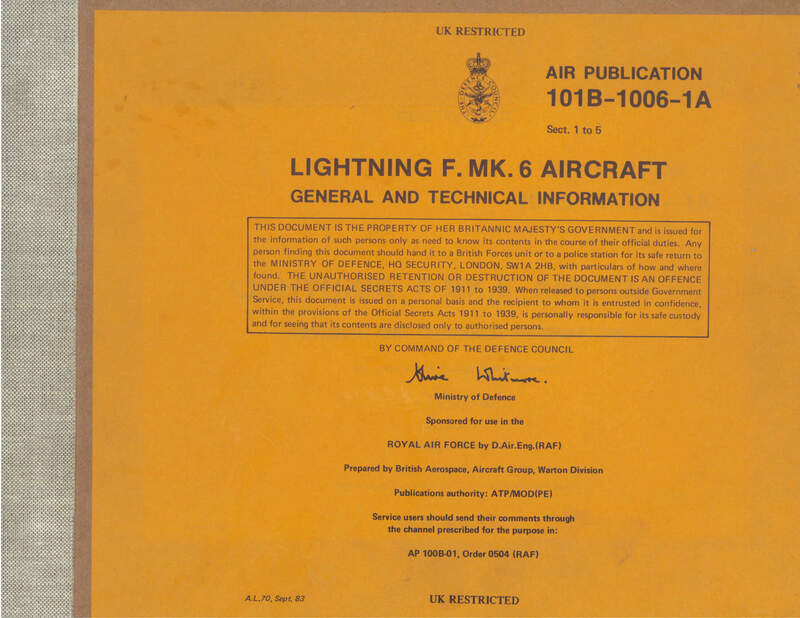 RAF Aircrew Manual for the Lightning F.3, T.5 and F.6, Book 2 – Weapons System, AP 101B-1003,5,6-15B, dated June 1969 with approx 163 pages. 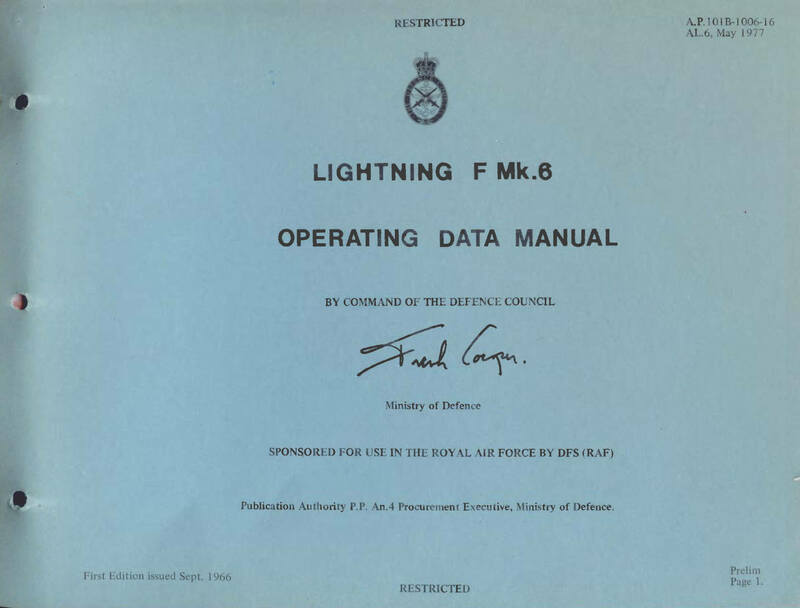 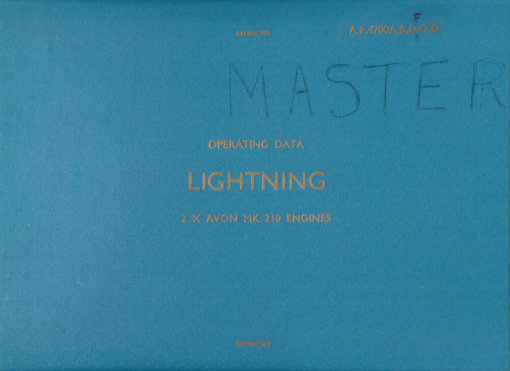 RAF Operating Data Manual for the Lightning F.3 and T.5, AP 101B-1003,5-16 at AL16 dated July 1985, with approx 334 pages..
RAF Aircrew Manual for the Lightning F.2A, AP 101B-1007-15, dated July 1968 with approx 133 pages. 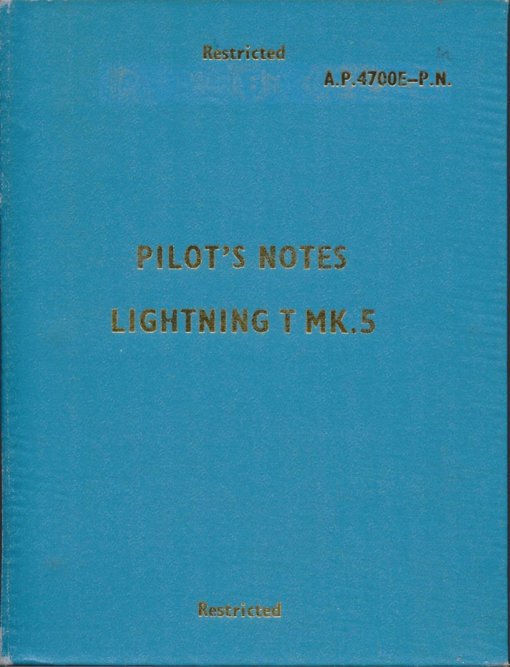 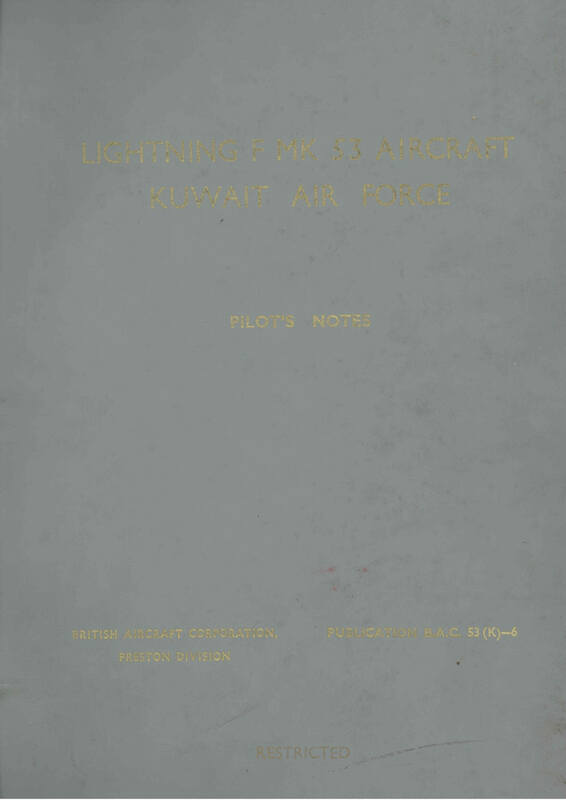 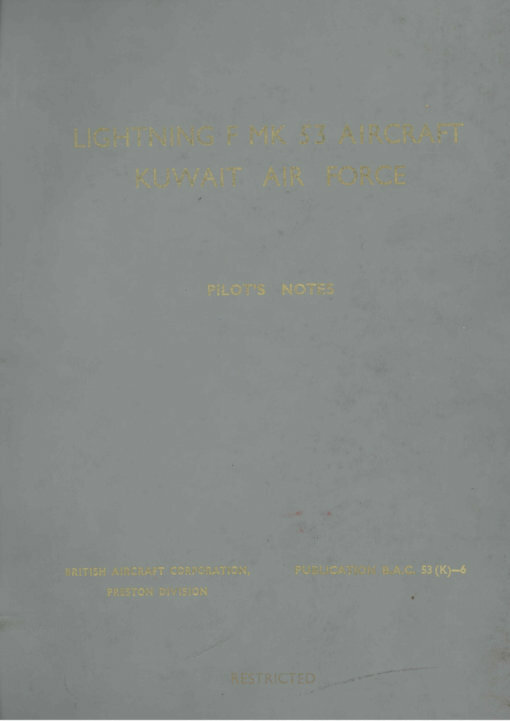 Manufacturer’s Pilot’s Notes for the Lightning F.53 (Kuwait) dated August 1968 with approx 276 pages. RAF General and Technical Information Manual (Volume One) for the Lightning F.6, Books 1 and 2, AP 101B-1006-1A and 1B, with approx 832 and 658 pages. 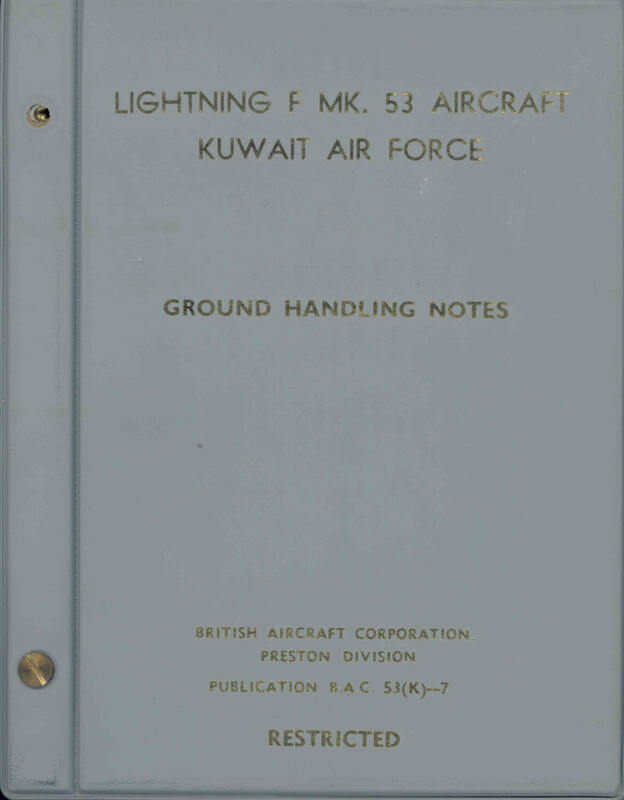 Manufacturer’s Ground Handling Notes for the Lightning F.53, BAC 53(K)-7 undated with approx 50 pages. 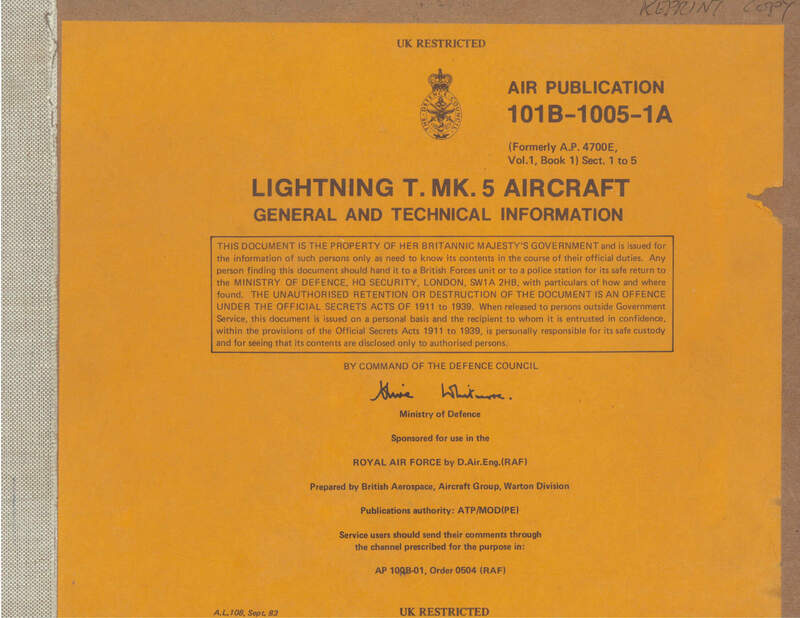 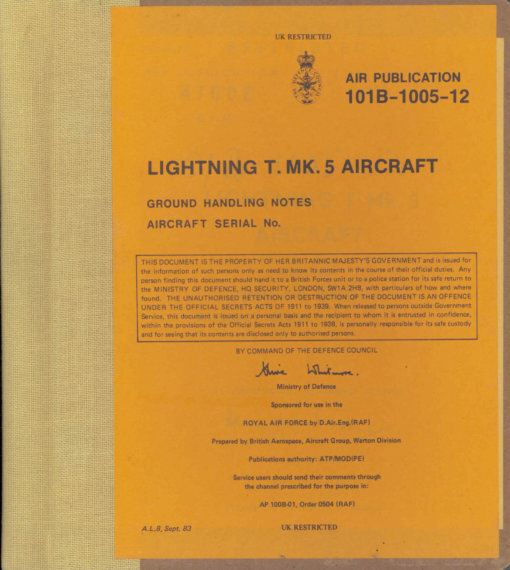 RAF General and Technical Information Manual (Volume One) for the Lightning T.5, Books 1 and 2, AP 101B-1005-1A and 1B, with approx 750 and 628 pages. 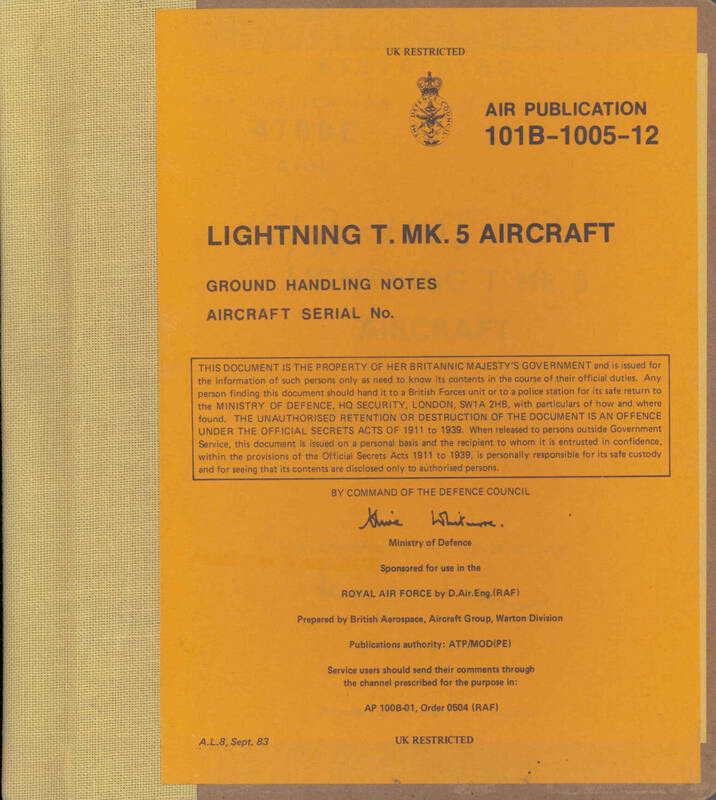 Manufacturer’s Ground Handling Notes for the Lightning T.5, AP 101B-1005-12 with approx 56 pages.